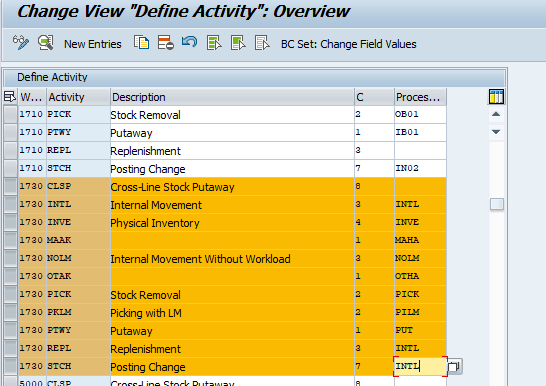 I want to explain how to configurate Labor Management in SAP EWM. Let’s start to learn what’s labor management and funcitons? Labor management helps you to plan labor times and resources in your warehouse more effectively, thereby making your warehouse more productive. After planned work is executed in the warehouse, a comparison can be made of the planned versus the actual times. Labor Management has the ability to be connected to an external HR system. The system creates automatically for each external process step and activity area a document for the planned workload. After performing the work, you can use the executed workload to compare the planned and actual durations. Each task in the warehouse has a certain workload. 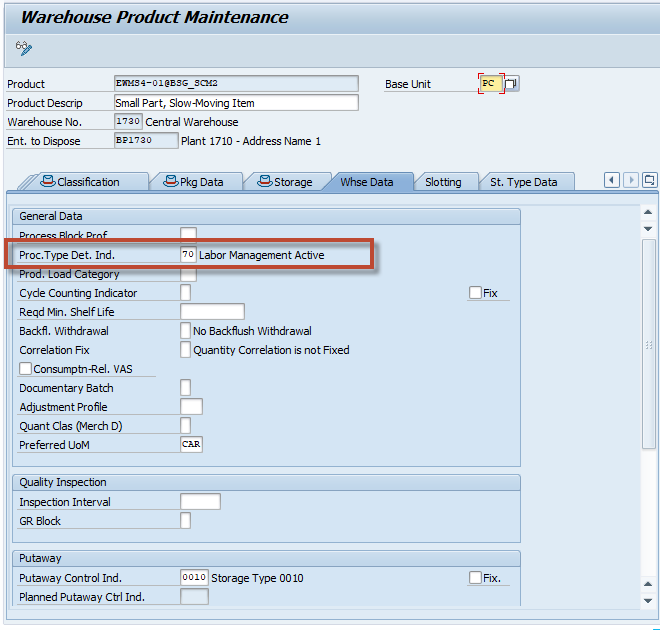 You can only plan this workload if the scope of the task involved is fixed, for example, if a warehouse order that has various warehouse tasks has been created. After executing the work, additional data is then available, such as which worker executed the work, the exact start and finish time, and the resources used. You can use the information contained within the planned workload document to make strategic decisions. For example, this enables you to use the total of all planned activities in a particular activity area, on a particular day, to plan the number of employees for this day, in this activity area. SPRO → Labor Management → Activate Labor Management. The processor is defined as a business partner with role Processor (LM001). Along with address data and assignment, the user-name of the processor must be entered, You must also specify in which warehouse a resource works, and which processes they support. A labor factor can also be entered to specify a labor rate for a worker. This could be a standard or actual amount. You can also define (by selecting relationships) whether a processor is a member of a group, or group leader. Utilizing the business partner allows us to use the processor role in other applications. The processor record is entered once, and is then available to Labor Management, as well as to additional applications. 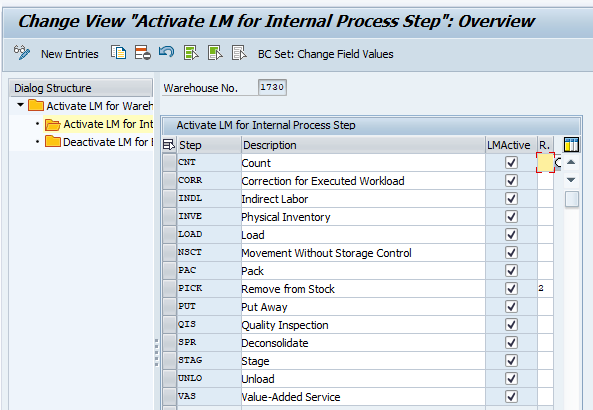 Information related to processors can also be viewed in the warehouse monitor. 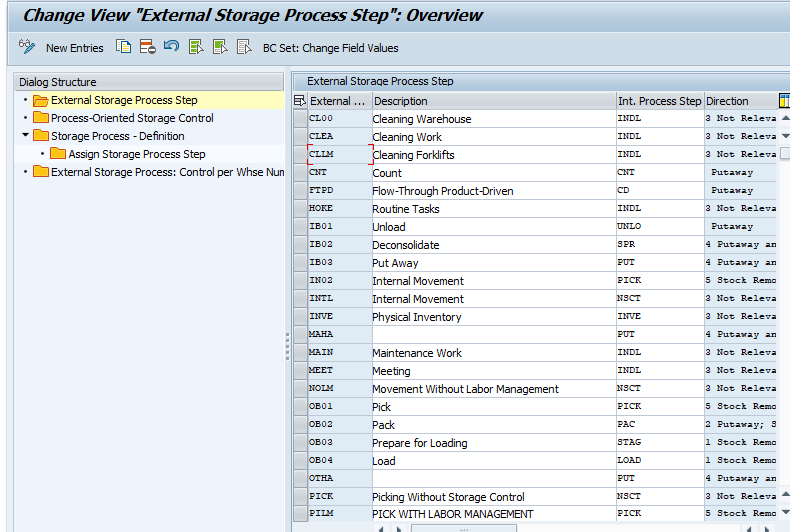 SAP menu → Extended Warehouse Management → Master Data → Resource Management → Processor → /SCMB/PRR1 – Create Processor. 1. Define an entry for the preprocessing header. 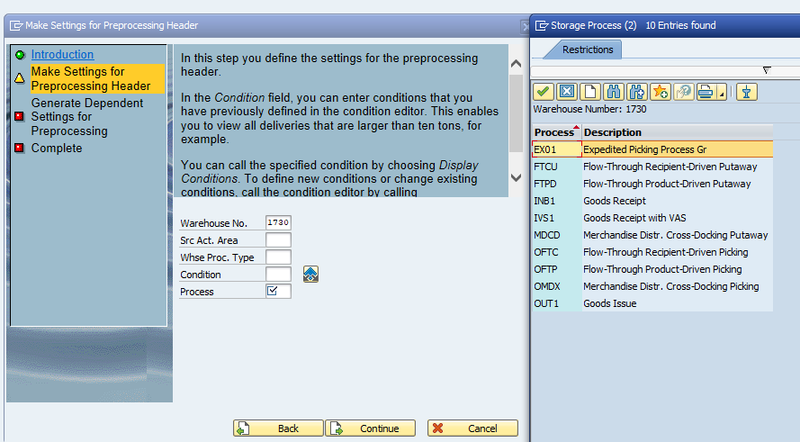 You can use the warehouse number, an activity area, or a warehouse process type as a key. When determining preprocessing, the system then selects deliveries with these attributes. You can also assign a condition and a storage process to the preprocessing header. The storage process is used to determine the process steps that are relevant for the delivery in the warehouse. You can define the condition in the condition editor. It is used to find different storage processes for special attributes of the delivery items. In this way, for example, you can differentiate between substances that are hazardous and non-hazardous. 2. 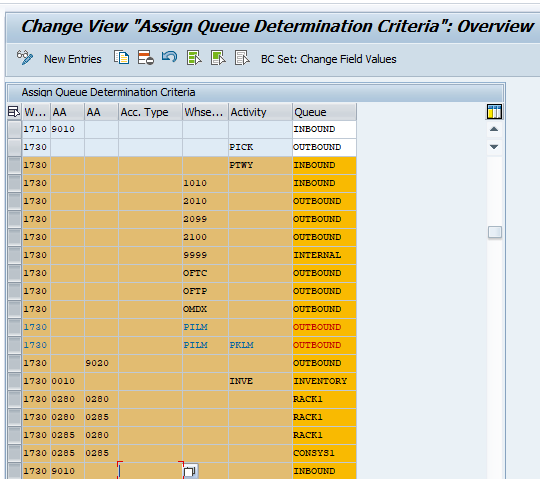 If you have created an entry for the preprocessing header, you can create dependent entries for the preprocessing item. Each entry corresponds to a step that will take place in the warehouse for the selected storage process. You are free to combine these steps in any way you choose. You can specify an activity area in which the workload will come about. You can also control the amount of workload that is generated. Here, you specify a percentage, which is offset with the determined workload. You can use a condition at this level to check special attributes again, such as defined maximum weight. Finally, you can specify duration for a process step. This duration is later used to determine when a process step occurs in delivery processing. Like in some other functions in EWM, you can define settings for preprocessing with the help of the system. The advantage of this is that the system reads and suggests all process steps for the preprocessing item from the storage process specified in the preprocessing header. This enables you to configure preprocessing analogously to the storage processes without great amount of effort. 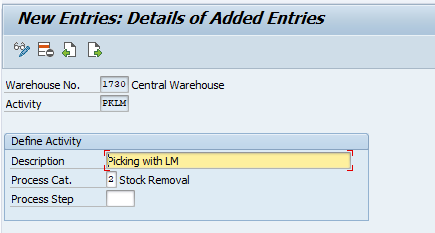 When you create outbound task and then go to confirm transaciton, you will check LM acitve area. After then you will select to start WO, start date and time will come automatically. At last step, when you will finish picking, click confirm and save bottom also confirm date and time will come automatically. Labor management is the very important for controlling employees performances. Because you check employees performances by day to day or per monthly. 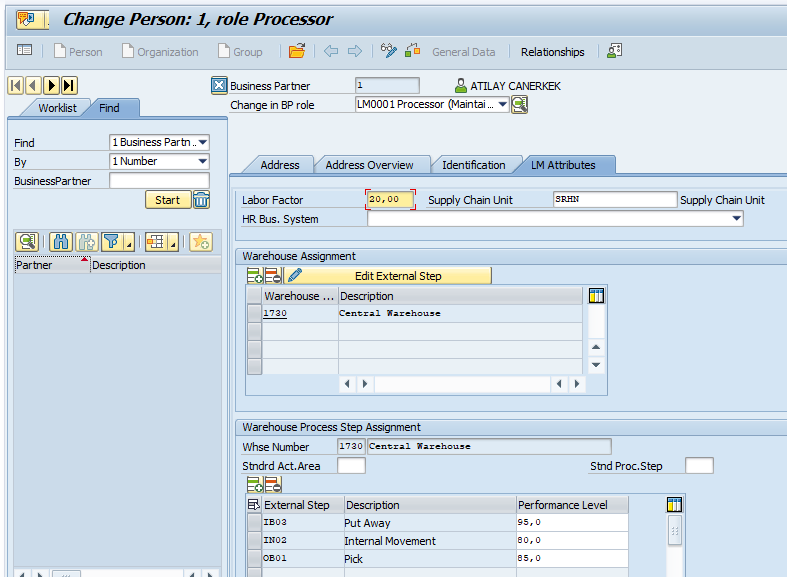 Resource that means employee, they will be also check performance with RFUI.